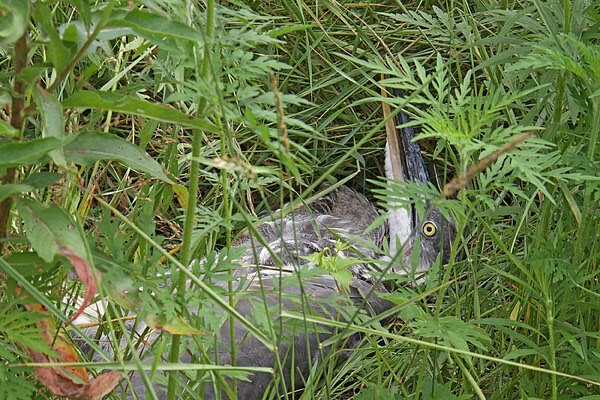 While on a forced march with Ranger Danger at Three Rivers County Park, we encountered this Great-Blue Heron laying on its back in the tall grass on the edge of the lake. Ranger got birdie and alerted me to the herons presence, I was able to shorten his lead before he ever saw the bird. Herons are a shy and solitary bird, they will squawk and take to the air before you realize they are there. To be sure, I was surprised to able to get so close to a live heron and puzzled because I've never seen a dead one. Had to take at least one pic. During the setup, I could not see any obvious injuries. Maybe an illness has it down, Bird Flu or West Nile Virus? I should get the pic and let nature take its course. I focus on the birds yellow eye, hmmm, the eye is clear and the pupil is focusing ever so slightly. It just took a breath, shallow and slow but constant. This bird is not dead, dieing maybe but not dead. Got this shot and left the bird in peace. Not trying to experience the bird flu or west nile. After working on this image and thinking about animal behavior, I am willing to believe that this bird made a fool of this predator. Yes, the oldest survival trick in the book of life, "Play Dead".